Earlier this week, I was fortunate to come across a captivating exhibition in Venice, called Isola Nova. Presented by the Wilmotte Foundation, “Isola Nova” is the work of French artist Philippe Calandre, who’s work is a combination of photography, painting and video. 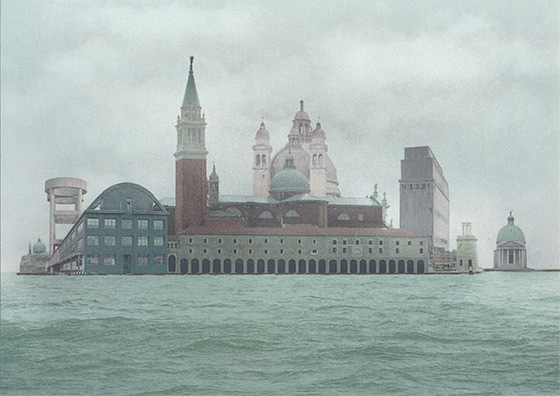 Isola Nova presents a series of imagined new islands, drawing on both the real and the imaginary, combining elements of the real Venice with steampunk-like industry, set within a lagoon of dark, restless seas and skies. The work is also reminiscent of the original Myst game, with its small, mysterious islands hiding disjointed artefacts and baffling technology. But there is something fundamental about this vision of complex yet contained worlds which strongly appeals to me. I am always drawn to islands, wherever I find them, and the real islands of the Venice lagoon are mysterious enough to me, never mind the fantastic creations of Isola Nova. The originals are printed quite large. The photography is meticulous, exquisite - ands largely irrelevant. This is photography as an raw material for creativity, not as the end point, and in my opinion this is truly deserving of the label “art” in a way which very, very little photography is. It’s also sort of the way I first got hooked on taking photography seriously, as an input to illustration. I guess Isola Nova would not be to everybody’s taste, but if by chance you happen to be in Venice before Feb 15th, and you can find your way to Fondamenta dell’Abbazza in Canareggio (it’s not that hard, but it’s a bit off the tourist circuit) then really, the exhibition is well worth a visit.